Sarah and Angus Moorcroft have every reason to want to start over after the death of their daughter Lydia in a tragic accident. When they decide to move from London to a remote Scottish island, they believe it is a fresh start for them and their remaining daughter, Kirstie. Despite thirteen months having passed since her sister's death, Kirstie's behaviour is becoming increasingly disturbed as she attempts to cope with the loss of her twin sister. The move to Scotland only exacerbates her problems however, and Sarah begins to doubt whether she truly knows which twin died that summer evening. As Angus withdraws from his wife, suspicions mount, until the reader is just as uncertain as the characters. Using the backdrop of the remote island, complete with deadly causeway this book is a gripping thriller and a story which stays with you long after you've turned the final page. 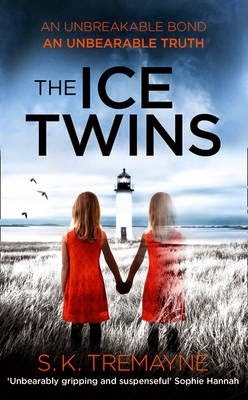 The Ice Twins is an atmospheric and disturbing novel, in which the skill of the author is in their ability to lead the reader astray. These false turns in the story only add to the sense of unease and the need to turn the page. Indeed, the reader is kept hanging on right up until the tense final pages which deliver an ending which will not disappoint.